Do your best to really hear why they don’t want to join you on the water. Maybe they’ve had a bad past experience. They’ve gone boating and gotten scared, or the people they went with were drunk or unsafe. Perhaps they went swimming and got into trouble, almost drowned, were terrified. Or, they’ve heard horror tales or can’t swim, or maybe just didn’t grow up around water and it seems like an alien environment. If you’ve really heard their reasons for not wanting to go boating, then you have to realize that those reasons are very real to them. You saying something like, “That’s crazy and no good reason for you not to go with me!” ain’t gonna cut it with them. A much better approach would be, “Okay, I really understand where you’re coming from. Are you willing to hear me out and talk about how we may be able to overcome (work around, replace, etc) these concerns (fears, objections, etc) you have?” If the answer is yes, continue on. If it’s no, or “hell, no!” you’re on your own. We do Boating Tips here, not relationship counseling. So, they’re willing to give it a go, to trust you, to see if they can become a boater. Be worthy of their trust; come up with some reasonable ways to overcome their fears and objections. Can’t swim? Would they be willing to take some lessons? Or, more practically, explain how the life jacket supports them and all they need to do is kick with their legs and paddle with their arms (I’ve been around water all my life and am still a p-poor swimmer. Good PFDs are the only things that have kept me alive!). They got terrified by going with unsafe people? You’re very safety minded, etc, etc. Come up with a way to address each of their fears. Here’s where you gotta walk-the-talk. You have to do the things you said you’d do and you have to be patient. If your first idea of how to address a concern isn’t working, go to Plan B, and C and D, if necessary. And whatever you do, start slow, be gradual, take baby steps, if you need to. 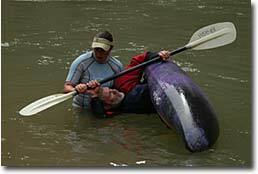 Don’t be like this friend of mine: I took him on a couple of raft trips and he fell in love with the inflatable kayak. He was a daredevil, not afraid of much, so the IK was perfect for him. He wanted it to be a family activity, so he went out and bought four IKs. So far, so good. But, where does he launch the family in their brand new boats? Why, one mile above a Class IV rapid. Of course, it was a total terrifying yard sale and he’s left scratching his head over why they didn’t want to go with him anymore. 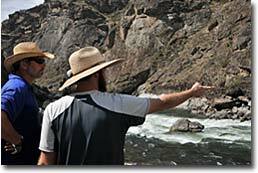 Greg and Andy working together to figure out a safe line through Snow Hole Rapid, Salmon River, Idaho. Fear of water is a legitimate fear; it is an alien environment. We’re inherently land creatures, lost the gills some ways back. If you need proof, try holding your head under water for 10 minutes. Get them used to water. 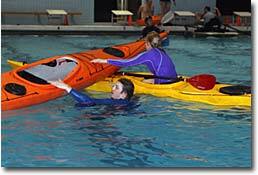 Put them in a properly adjusted life jacket and into some placid water, in a pool, lake or easy river. Let them get used to the sensations. With their permission, dunk them under water to demonstrate how quickly the PFD brings them back up. Then, and only then, take them boating. But start out slowly… baby steps, remember? Yeah, you like Class IV/V but make their early exposure Class I/II. If touring or sea kayaking is your thing, don’t make their first trip a channel crossing in gale force winds. As things progress, get them in the water under conditions they may be exposed to. Get out with them and float through a simple rapid in your PFDs. For kayakers, practicing wet exits and self recovery builds confidence. And consider this: You may not be the best person to provide this instruction. Your intense desire to make it succeed may get in the way. Check around and see if applicable classes are available. Many colleges and universities have outdoor programs that offer classes for beginners. There are also companies that do training; search for them online or advertising in boating magazines. With proper planning and patience, your chances of turning them into a boater are pretty good. They may never be as gung ho as you are, but if they can enjoy any level of the boating experience with you, there’s a bond in your relationship that’s worth the work. And who knows, they may really dig it and even become a better boater than you. Hmm, in that event relationship counseling may be in order! I’d like to hear your thoughts and feedback. Have you had success in this area? Have you had disasters? Know anyone else who’s been successful? Got any advice of your own? Drop me a line, to editor@nrs.com. Boat Often, Boat Safe, Spread the Boating “Gospel”!